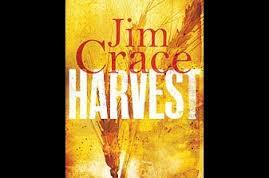 Jim Crace's new novel is the Booker favorite apparently. It's set in an English peasant farming community in pre-modern, pre-literate times. Superficially it's a simple pastoral tale - 'the amity in everything' - but soon develops into a story of violent social upheaval.Economic 'progress' brings personal and communal disruption, conflict, brutality and revenge. 'Witches' are outed, outsiders are blamed, banished and pilloried, and former friends suddenly become enemies for no real reason. The problem I have with the book is that these themes are not new. There's nothing original here. The writing is strong, muscular and poetic, particularly in its descriptions of nature in all its moods, but there is little reach into deeper, more resonant meanings. There are no surprises, no dramatic shifts, nothing to break the calm, measured progress of the narrative. It's a book that will not stay with you. I find that disappointing, particularly in a year when JM Coetzee's extraordinary The Childhood of Jesus did not even make the long list. That remains a travesty.